What Gibson’s language strains to reveal in that event, or more properly, in our experience of it, is the sense of vertigo it induced, of the collapsing of boundaries: political, geographical, personal, ethical, its singularity lying not in its death toll, or in its nature but in our experience of it, the way it unmade the certainties that not just our present but our future were grounded in. Whether it was begun before or after September 11, this sense of our experience of reality exceeding itself is wound deeply into Pattern Recognition. 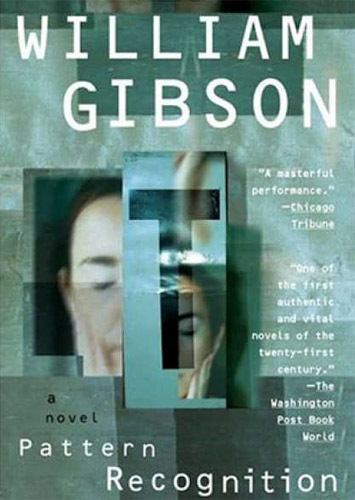 Not only is it the first of Gibson’s novels to take place in the immediate present, it also seems to represent the closure of some kind of circle in his writing, not least in the allusive play between the names of its protagonist, Cayce and the anti-hero of his groundbreaking first novel, Neuromancer, Case. Of course to call Gibson a writer of science fiction has always been to misunderstand him. Gibson’s antecedents lie more in Burroughs and Pynchon than Arthur C. Clarke, their strange, essentially poetic assemblages of image and echo designed to explore the inner textures of a culture which exists increasingly outside of time and space. The effect is probably nearest to that of an intellectually rigorous brand of video-art: suggestive, unsettling, and unresolved, its meanings arising out of the interplay between the elements rather than residing within them. And so, despite its contemporary setting Pattern Recognition is classic Gibson. Moving between London, Tokyo and Moscow, it turns upon a series of film fragments which have been appearing anonymously upon the internet. These fragments, in an echo of the Joseph Cornell-like assemblages of Count Zero’s artificial intelligence, are possessed of a mute, almost inexplicable power, a power attested to by the global underground following they have attracted. Carefully denuded of any identifiable signs of context or origin, the fragments may or may not be part of some larger work, yet regardless their power stems from their sense of compression, the way they seem to signify the possibility of a meaning which they simultaneously deny. Cayce, a follower of the footage herself, is commissioned by her sometime boss, the wonderfully-named Belgian market-guru, Hubertus Bigend (who “seems to have no sense at all that his name might be ridiculous to anyone, ever”) to establish the identity of the footage’s creator. Bigend’s motives for doing so are ambiguous to say the least, but Cayce accepts nonetheless, a decision which drops her deep into a world of obsessed footage-heads, industrial espionage, Russian mafia and cryptography, only to fetch up, finally, in the painful truth of the footage’s origins. Woven through this are a collection of images which play off each other with ever-increasing subtlety and power. The pictures of the missing pinned to windows and walls and doors in New York. An amateur archaeological dig near Stalingrad, where guns and badges, uniforms and eventually an entire Stuka, its pilot still in its cockpit are being drawn from the suffocating, erasing mud by Russian skinheads. Diagrams of the arming mechanism of antiquated American explosives are uncovered coded deep inside the footage. Mechanical calculators designed in Buchenwald are traded to collectors from car boots, resembling nothing so much as grenades. And everywhere, out of the fragments of the past, the present and the future, meaning suggests itself, elusive, partial yet possessed of a strange and ultimately deeply moving poetry. Originally published in The Sydney Morning Herald, 15 March 2003.